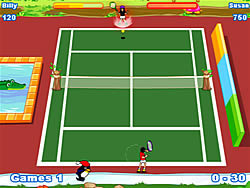 Try to ace your opponent on this twisted tennis court! Hit the obstacles to build up power for a smash hit! Try to ace your opponent on this twisted tennis court! Hit the obstacles to build up power for a smash hit!